If you talk to someone in variable frequency drives (VFD) sales, they will often tell you that there is no place for a soft starter because the VFD reduces the current more than a soft starter and the VFD saves energy, but in reality there is definitely a place for both of them. If you need to vary the speed of the driven load, then a VFD is definitely the choice. If you are looking to reduce the starting current and the starting torque of an induction motor, then a soft starter can be selected. The soft starter will typically reduce the start current from 600 - 850% down to 300% to 450% depending on the motor characteristics and the load characteristics. Once up to full speed, the soft starter is commonly bridged out or bypassed, so there is no additional loss when running. 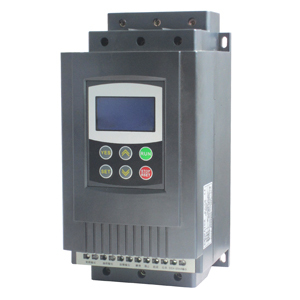 With a VFD, there are a number of advantages and also a number of disadvantages relative to the soft starter. If the load speed is constant, then yes, you can start the load at less than 100% current provided that the load can be started at less than 100% torque, but while the VFD is running, you have heat losses in the VFD, typically in the order of 3% plus a small increase in the losses in the motor. The VFD constantly produces harmonic current draw from the supply unless expensive harmonic mitigation is employed. This is becoming an increasingly recognized and undesirable byproduct of VFDs, along with EMC issues which can be very problematic. The application will always guide you to the best solution. Starting torque and time limits, inrush current limitations, energy savings, speed control all will play a part. In larger horsepower soft start applications many solid state controllers will switch the SCR's out and automatically go to a bypass contactor to reduce the losses for full speed operation. This of course negates any possible energy savings in a voltage/current foldback controller. All electronic controllers will have limitations for current and torque that either cause dramatic oversizing to get a high inertia load to break free and get to full speed within limits, be it heat, time, current or a combination. If energy savings (reduced speed) is the issue a VFD will almost always be the first choice, but again the driven load, (VT) and application require review and sizing considerations. If speed control is the consideration then a constant torque load will require a VFD. The motor basics we have had to live with, NEMA design A, B, C & D are there for a reason as one design doesn't fit all applications. The controller is just another tool to use within it's limitations to provide the desired result for an application. Soft starter - considerably cheaper than VFDs, much more efficient, does not require harmonic mitigation, but draws 3 - 4 times start current and does not offer variable speed feature. Understanding the application and exactly what you are trying to achieve would be the most important factor.